Having pointed out that much of popular Christian language (and some images in sacred texts) lend themselves to the notion of a “two-storey” universe – and having noted that the second storey as the dwelling place of all things spiritual has almost insurmountable problems – how should we speak about such things? First, it seems that it’s worth thinking about what the words we use really mean in the first place. Perhaps the most common and universally used prayer in the Christian faith is the one taught us by Christ Himself. The prayer begins, “Our Father who art in heaven…” or does it? The text in the Greek varies. In some cases it reads “in the heavens” (plural) in others simply, “in heaven.” Of course Christian theology teaches us that though we may use spatial language to speak of God, we cannot say that there is some space “up there” where God dwells. God is not a creature such that He needs a place to dwell. In that sense, the word “heaven” becomes something of a grammatical place holder, a word that allows us to speak of “where” God is – all of which is fine – unless we become literal about it and make God subject to limitations that are simply incorrect. In that sense “heaven” is as “unspatial” as God is Himself. If you read classical theological texts such as those of St. Dionysius the Areopagite, it is quite clear that the Church has always understood that God is utterly transcendant. He is “beyond being,” in the language of St. Dionysius. The Fathers would say, in speaking of God’s Being, that in comparison to our “being,” God is not – meaning that though we speak of ourselves as having “being,” the “Being” that God has is wholly other and is not to be thought of as having an existence that is like our existence. In the same vein, the Fathers teach us that God is completely beyond our knowing. Or as Father Thomas Hopko says, “It is impossible to know God – but you have to know Him to know that.” This, of course, plays on the understanding that the God who is beyond knowledge, who could not have been known by us, willingly made Himself known, particularly in the person of Jesus Christ, God Incarnate. Thus Christ will say that “no one knows the Father except the Son” (Matt. 11:27). Christ’s promise to us is that “he who eats my [Christ’s] flesh and drinks my blood abides in me and I in him” (John 6:56). It doesn’t say that if you do this you will have visions of a second storey heaven or such things. The language is very “first storey.” Eat, drink, abide. The words are very here and now, though they change the nature of here and now. We are suddenly indwelt by Someone Whom even the universe cannot contain. That reality changes us. Remembering this saving commandment [“Do this in remembrance of me, etc.”] and all those things which have come to pass for us: the Cross, the Tomb, the Resurrection on the third day, the Ascension into heaven, the Sitting at the right hand, and the second and glorious Coming. It is fairly commonplace in Orthodoxy to note that Chrysostom’s Liturgy speaks of the Second Coming in the past tense. Not because we believe that Christ came for a second time at sometime in the past, but that because of what is happening in the Liturgy, we may speak of the Second Coming in the past tense. We are standing at the Messianic Banquet. If it is Christ who dwells in us and we in Him, then how is it possible that we are not with Him at the beginning and the end (since He Himself is the Beginning and the End)? God is with us! Understand Ye nations and submit yourselves for God is with us! 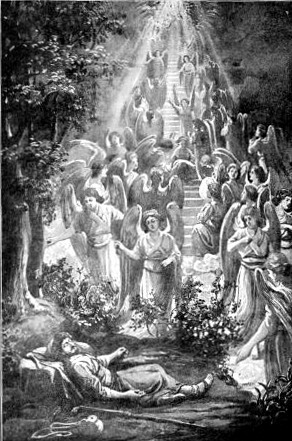 Then Jacob awoke from his sleep and said, “Surely the LORD is in this place; and I did not know it.” And he was afraid, and said, “How awesome is this place! This is none other than the house of God, and this is the gate of heaven” (Genesis 28:16-17). Of course, Jacob made a very first-storey response: he set up a stone, poured oil on it [consecrating it] and promised to serve God and to give Him the tenth of all he had. It is incorrect to think of the world of our faith in two-storey form. The Incarnation, at the very least, reveals that to be not the case. God is with us and has come to abide in us. That truly makes this storey the first. The picture seems marvelously two-storey. What can I do? Is it improper to suggest that prior to the Incarnation that the creation was 2 storey? Jesus came down from Heaven. He assumed human nature but he also took it with Him when He ascended. The Veil of the Temple was rent, Hades plundered. The acts and the metaphorical description of them seem to go on and on. To top it all off, He comes and dwells in us and we partake of His Body and Blood. There’s no roof on this house but their are no floors exactly either. What did Aslan say in Naria: Higher up and further in? A certain candidate for the Presidential nominee was recently discussing his family life for it has been a center for some controversy. This candidate said that his family life was totally private and that the debate should be over his public policies. While I agree that family should be respected by the neighbors, the realms of we the families and we the people are not exclusive. There is an overlay between the two. I think this is a contemporary example of the two-storey approach, n’est pas? Yes. I think there is something similar between the two. Michael, there is no doubt that some amount of second-storey language is present in Scripture, but Jacob had no doubt whatsoever about their mutual overlap, or something like it. God was not removed from him. It is interesting that the Fathers treated burglary worse than robbery. In both cases you steal, but the burglar thinks no one (not even God) sees him. But what I cannot find in the Scriptures is the kind of bifurcation that would have created a secular anything. It’s all permeated by God, and thus though there may be places that I do not go right now, nevertheless they belong to one and the same world. This may still be two-storey, but I think a great deal less so. The celtic mystics wrote of “thin” places – and what they meant was that the veil between Heaven and Earth was thin. So it’s not spoken of as going from one place to another, or seeing one place from another, but of being able to see the full reality of the place. Thy kingdom come on Earth as it is in Heaven. Heaven in scripture means the sky literally, but it also is used to speak of the presence of God. So we are asking God to be fully present within all his creation – to realize that vision in Revelation where there is no need for sun or moon or temple, because the Lord himself dwells with his people in the Holy City. The Earth will be filled with the knowledge of the glory of the Lord (Heaven) like the waters cover the sea. How do the waters cover the sea? They simply are the sea. This may still be two-storey language, but I think it’s a lot closer than much. In following your ongoing thoughts on the meaning of words, I’ve been thinking a lot about how much our…confused…use of language confuses us conceptually. Maybe we Orthodox need to go on the kind of campaign that Confucius went on about the “Rectification of Names.” Of course, will we be doing that in Greek, Old Church Slavonic, Romanian, English, or a little of each 🙂 ? All kidding aside, the more I think about the connotative meanings passed down in any language, the more I wonder if English, with its polyglot vocabulary and (relatively) informal grammar, will ever be able to faithfully convey the Truth of our faith without calling to mind erroneous beliefs when we use “loaded” theological terminology. In a way, it seems that you’re trying to eliminate this problem with the “one-storey” universe concept; the question I have, though, is how long does it take to change the connotation of Heaven as “that place in the sky where God lives” and Hell as “the place down there where bad people go?” My guess is, quite a while, especially when the majority of people who self-describe as Christians continue to hold that erroneous view? May God bless the struggle! The icon of the Transfiguration is so helpful to me in knowing that all is one-storey. Admittedly, there are things beyond our sight, but not because of distance, per se. The disciples beheld his glory, “as far as they were able.” God has come among us. I recall an early Russian cosmonaut commenting in a space flight that he saw no God up there. That’s the silliness of two-storey language. As we proclaim the good news of the Gospel, it seems primarily one-storey and so it should be proclaimed. Thanks for the note. I’m having a hard time not imagining the stairs as an escalator in the picture. Ha! My reading is mostly in the tradition I’m a part of. Forgive me for my ignorance when I reference only Western thinkers. I’ve read Capon’s The Mystery of Christ, where he describes the Incarnation as a sacrament of what has always been true. I take this to mean that the incarnation did not effect the “indwelling” of creation by God, but rather made it clear. It this your understanding? I come from a Reformed “Vos-ian” biblical theology tradition, and one of the insights I’ve come to appreciate is that creation as first established wasn’t perfected. (I believe this is in keeping with St. Ireneaus’ understanding, as well.) It was good, but not mature- not what it would one day be. This new creation was accomplished by the second Adam. If Christ’s taking on himself our nature and elevating it into the life of the Blessed Trinity is what brings about that new creation, doesn’t it follow that this union of heaven and earth was absent, at least as it now exists, before Christ’s advent. I’ve understood Revelation’s picture of the New Jerusalem descending to the earth to be about a union that did not exist before Christ’s work. It had to descend. I guess my conceptual framework resonates with the question Michael Bauman asked above. I’ve understood the two-storey universe as something Christ overcame- and had intended to overcome by the Incarnation, regardless of whether or not the fall had taken place. The renovation of Creation into a one storey apartment was the perfection towards which God intended all along, but the renovation (the maturing of a good thing) had to take place. It’s always a little problematic when we inject history (at this point is was, at this point it wasn’t, etc.) into the matter. The Lamb was slain from before the foundation of the earth. We tend to make everything a bit too linear, when, in fact, since Christ is the Alpha and the Omega, it’s always true in Him and always has been. Perhaps we can talk about something being made manifest, etc., a maturing, but I would suggest not dwelling too much on a linear view of things (it’s a lot like second storey) with its problems. I’m trying to get my head around this (or this around my head) I’ve always thought of our Lord’s comments regarding John the Baptist being less than the least of those who have inherited the Kingdom to be based on our having what he did not. Also of a real linear change in regards to the harrowing of Hades. In the lives of men and women, whether they lived B.C. or A.D. seems to have spiritual significance. Is this wrong headed? Thank you for your patience. This series is insight for many of us. Thank you for sharing with us in this forum. I don’t know if this is quite right and maybe it is still two story thinking but I think that in a sense there is a real linear change. God’s eternal plan, must be brought down into, made manifest in, time. Think of eternity not as endless time but as the whole of God’s work of creation existant as a single unity wholly present in every moment of time. The process is one of time gradually being subsumed into eternity – thy will be done on earth as it is in heaven (eternity). When God’s will is done on earth this is the place where heaven and earth are fully one. There is no more separation caused by the fall. Oyarsa: Very interesting. Like Castenada’s “crack between the worlds”. Fr. Thank you for a very interesting and instructive series of essays. It makes my brain wrinkle but its good for me. Just as you mention, Christ is pre-eternal and the Alpha and Omega, yet our rational minds still want us to think in a linear manner using history and chronology to impose order on something that is truly out of time. In the tomb with the body, in hades with the soul yet as God, in paradise with the thief, and on the throne with the Father and the Holy Spirit, wast Thou, O boundless Christ, filling all things. Kind of gives a new meaning to “if I make my bed in Hell, there you are also.” But then, Jesus tends to do that, doesn’t he? yet our rational minds still want us to think in a linear manner using history and chronology to impose order on something that is truly out of time. I think, if we are to be true to a one-story vision, we need to be careful with the “out of time” talk. That gets into the familiar dualism of time-eternity, matter-spirit, earth-heaven stuff. I think it’s more helpful to think of time as connected in ways we might not see. For instance, at passover, the child asks “why is tonight different than any other night?” and is answered “because we were slaves, and tonight we are free.” Now wait a minute – that was thousands of years ago! What do you mean “tonight”? But they understood that they are part of the people of God, and that somehow this night, tonight, is part of that night. They are experiencing the exodus. So with the Eucharist – Christ our passover IS sacrificed for us! We are there, we show his death, here, now, in the breaking of the bread. It’s not that it was a “timeless” event – no, it reaches all through time, twisting time together into a glorious bow, where we encounter the crucified lord as we dine somehow in that great feast with all the saints that will come at his glorious appearing – and do it all at this moment. I think perhaps rather than speaking of time being changed, it is correct to say that liturgically we are at two places, etc. The sacrifice on the Altar is a bloodless sacrifice, in that the One Who is made present, is the sacrificed Christ. We do not sacrifice Him again. But mostly not to create yet another two-storey world, the here, the then, etc. History has become as inaccessible to us as all the language of second-storey. I don’t think we’re meant to put it in historical terms stretching across millenia, per se. I might add, that in a Church that venerates relics, it’s not the past that is so interesting as the present. I once told someone who came from a nearby Episcopal Church (St. Stephen’s) to visit, that our Church (St. Anne’s) was in some sense the true St. Stephen’s. We have a relic of him. She was surprised but also not really interested. St. Augustine wrote at length about St. Stephen’s relics when we received a portion at Hippo. God is with us and so are His saints. Some of his saints are even physically present. Yes – that does seem to be a less clumsy way of putting it. Not that time is changed, but that it is connected in ways we don’t often realize – especially in the case of the Divine Liturgy. We really are there, at the Via Delarosa and the Great Marriage Feast of the Lamb. Re linear time and the notion of salvation history or narrative, I benefitted from Fr. John Behr’s book The Mystery of Christ: Life in Death, which I reviewed here. Pingback: They didn’t miss it…We did!! !